Jorio, Andre de. 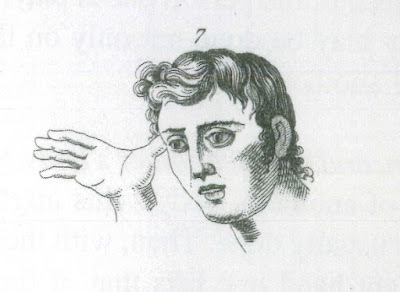 La Mimica degli Antichi investigata nel Gestire Napoletana [Gesture in Naples and Gesture in Classical Antiquity: A Translation of La Mimica degli Antichi investigata nel Gestire Napoletana: Gestural Expressions of the Ancients in the Light of Neapolitan Gesturing. Trans. 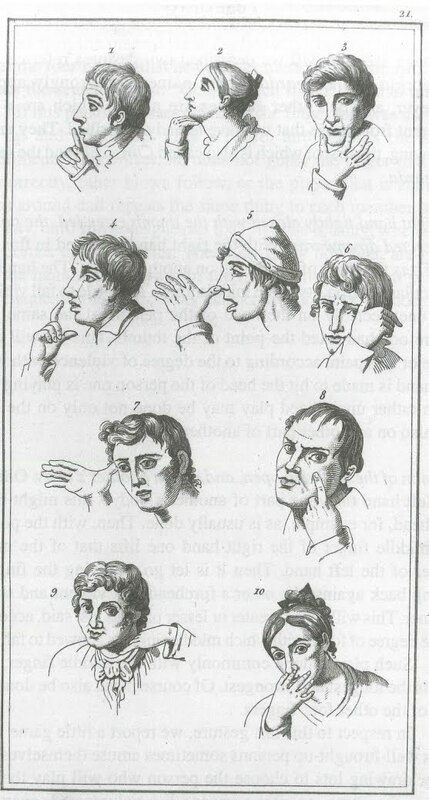 Adam Kendon. Bloomington: Indiana University Press, 2000. Nay, as they dare. I will bite my thumb at them; which is a disgrace to them, if they bear it. Is the law of our side, if I say ay? I didn’t have a quick and easy answer for him. I just had a sense, from seeing different stagings and different films, of what I imagined it to be. 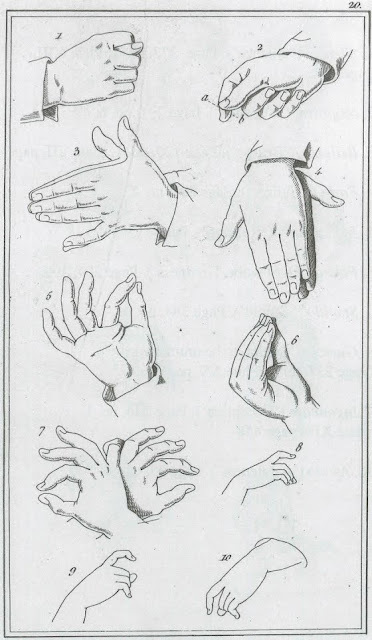 After asking some Shakespeare enthusiasts on Twitter (and receiving some help from @mirandafay), I pursued three different avenues of research: The Arden Editions of the play, a scholarly work on Italian gesture, and the Internet. 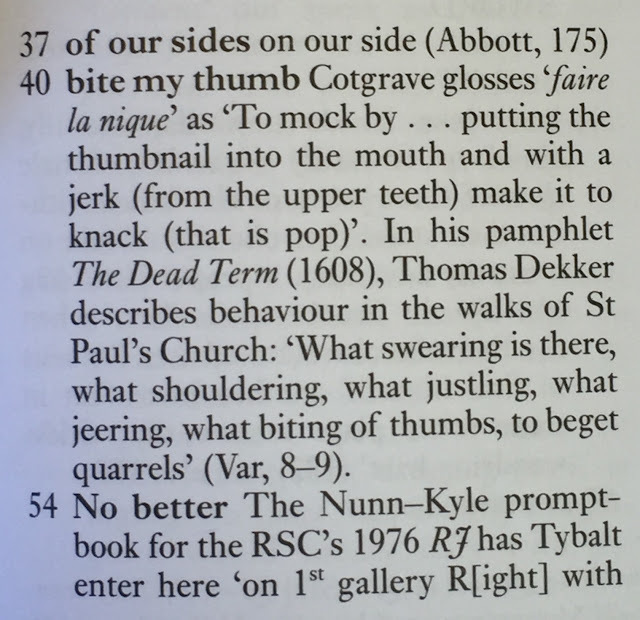 The Dekker quote in the third series’ gloss is very helpful, giving us a roughly-contemporaneous London use of the biting of thumbs—designed, it seems, to beget quarrels. Gestures, especially seen from outside the culture, can be quite ambiguous, but this book connects the gesture to the utterance manco nno ttècchete—"You are nothing to me." 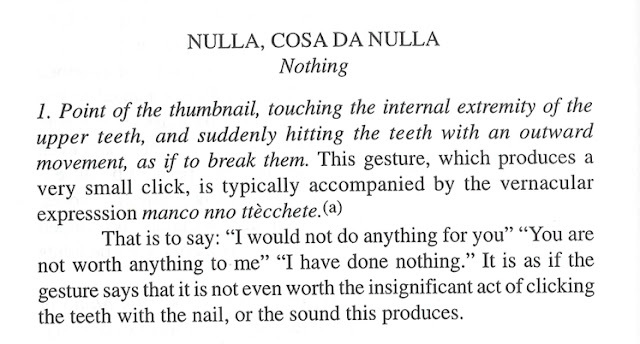 In Zeffirelli, the thumb is not actually bitten—but it is prominent in instigating a quarrel. Baz Luhrmann goes (as usual) fairly far over the top. I include some of the other excesses that surround his version of the thumb biting. There you have it—all that from a single line in Shakespeare. Bonus! A few Italian gestures, including number seven—Stupido. Cotgrave, Randle. 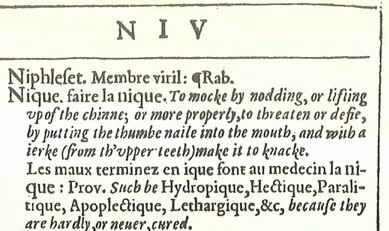 A Dictionarie of the French and English Tongues [Compiled by Randle Cotgrave, Reproduced from the first edition, London, 1611 with introduction by William S. Woods.] Columbia: University of South Carolina Press, 1950. Romeo and Juliet. Dir. George Cukor. Perf. Norma Shearer, Leslie Howard, and John Barrymore. 1936. DVD. Warner Home Video, 2007. Romeo and Juliet. Dir. Franco Zeffirelli. Perf. Leonard Whiting and Olivia Hussey. 1968. DVD. Paramount, 2000. Romeo + Juliet. Dir. Baz Luhrmann. Perf. Leonardo DiCaprio and Claire Danes. 1996. DVD. Twentieth Century Fox, 2002. Shakespeare, William. Romeo and Juliet. Ed. Brian Gibbons. Arden Shakespeare. London: Routledge, 1980. Shakespeare, William. Romeo and Juliet. Ed. René Weis. Arden Shakespeare. London: Routledge, 2012. Superman III. Dir. Richard Lester. Perf. Christopher Reeve, Richard Pryor, and Margot Kidder. 1983. DVD. Warner Home Video, 2006.